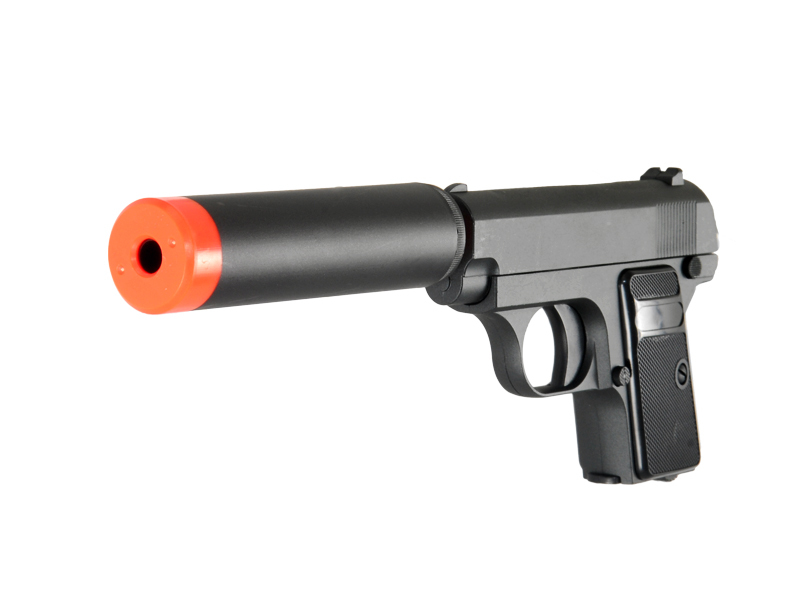 Introducing the Spring Silenced Metal 911 .25 Pistol. 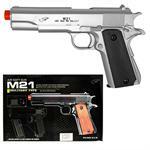 This fantastic airsoft gun has a metal body giving it a nice weight and sturdy feel, something you just can't get with plastic airsoft guns. The compact size makes it easy to slip into your pockets so no one will know you are packing. And what really makes this gun unique is the silencer, so if you want to go for a more stealthy look then simply screw it on. 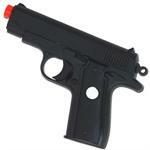 This is a Spring Airsoft Pistol, which means it's powered by a spring and must be cocked for each shot. It's fast, clean, inexpensive and easily maintained; it requires no gas or batteries to operate. Also, Spring Airsoft Guns are the toughest, most durable of all Airsoft Guns, because they're made with few breakable pieces.